A classy science fiction film tackling disarmament themes, The Day The Earth Stood Still is a compact thriller with a timeless message. A spaceship lands in Washington DC. On board are two aliens: the human-like Klaatu (Michael Rennie) and the giant robot Gort (Lock Martin). Klaatu is shot on arrival by panicked army soldiers, but anyway tries to communicate an important message with squabbling world leaders. Gort has advanced ray weapons capable of zapping and disintegrating any threat. 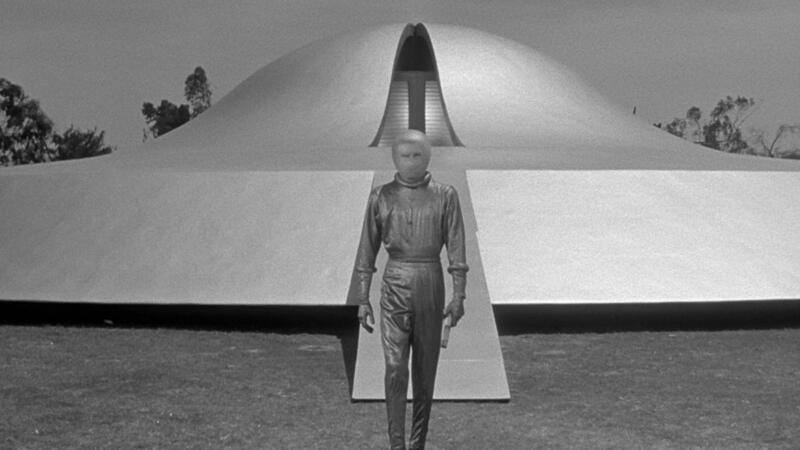 Klaatu slips away from the hospital and assumes the identity of John Carpenter to mingle with humans. 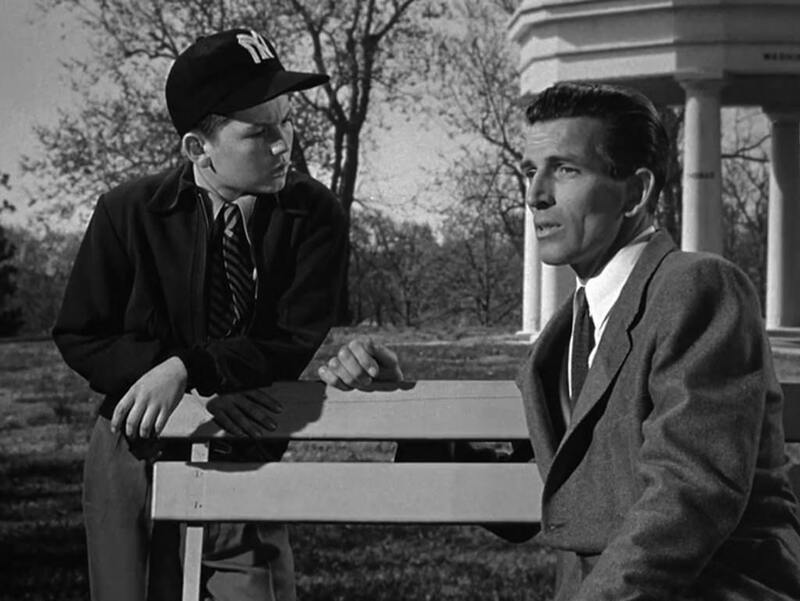 He books into a small hotel and befriends war widow Helen (Patricia Neal) and her young son Bobby (Billy Gray). Klaatu makes contact with Professor Jacob Barnhardt (Sam Jaffe), who helps organize a scientist summit to hear Klaatu's message. But with a massive manhunt closing in on him and Helen's boyfriend Tom (Hugh Marlowe) starting to get suspicious, Klaatu may run out of time. Smoothly directed by Robert Wise with a script by Edmund H. North, The Day The Earth Stood Still was an early attempt to inject mature and thought-provoking themes and substantive budgets and talent into the sci-fi genre. In this story the humans are the war mongering dummies and the aliens are the technologically and cerebrally more advanced sage advisors with a warning for Earth. On a cold war footing and treating the newcomers with the blunt tools of soldiers, machine guns and tanks, human behaviour is immediately revealed to be infantile. The film looks seamless, the alien technology impressive and the mission focused. The imagery is often striking, and in portraying the spaceship, Gort and the display of alien abilities, Wise crafts enduring cinematic milestones. But the story establishes its singular objective early, Klaatu out to gather world leaders to deliver a warning message of great consequence. It takes all of the 91 minutes of running time and plenty of distractions that would not stand up to logical scrutiny to arrive at the opportunity for the big speech. And the climax proves to be a truncated affair, predictable but also bewildering in its brevity. The sense that money, time or ideas ran out lingers in the air. There are some either deliberate or coincidental religious undertones to be found, Klaatu's adopted initials of JC and fortuitous Carpenter name providing clues, and late in the film he undergoes a more obvious rejuvenation thanks to help from the all-powerful Gort. The symbolism, whether intentional or not, is confined to the background. Michael Rennie reached a career highlight in his disciplined central performance as Klaatu. He succeeds in portraying the alien as a quick study but still a new arrival to the planet, using an easy but sharp demeanour to fulfil his mission. Patricia Neal is the most prominent and sympathetic of the humans. Hugh Marlowe as her boyfriend represents more human faults in the form of self-serving greed, while Sam Jaffe is suitably Einsteinesque as Professor Barnhardt. The Day The Earth Stood Still raises an astute mirror in front of the human condition, revealing a worrisome image.